You may have noticed that the health world is abuzz about shirataki noodles, a (fairly) new food to America that some are calling one of the best foods for weight loss. 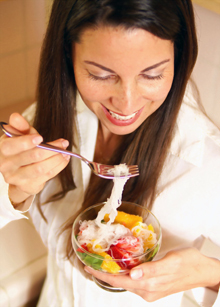 So what are shirataki noodles and how can they help you lose weight? Read on to learn more about this popular weight loss food and how it can help you shed those unwanted extra pounds. Shirataki noodles have been used in Japan as a low-calorie food for thousands of years and have been steadily gaining popularity in the States the past few years. Made from konnyaku flour produced from a root native to Asia, shirataki noodles are a gluten-free, healthy pasta substitute that can replace traditional high-calorie, carb-heavy, processed starches in all of your favorite dishes. What do shirataki noodles contain? Depending on your flavor of choice, one serving of shirataki noodles contain zero to low calories – and by low we mean as little as 15 calories per serving. Compare this to the 182 calories that 1 cup of cooked, small shell pasta has, it’s easy to see why calorie count alone is reason enough for anyone trying to lose weight to make the switch. How does that help me lose weight? One of the most basic facts about losing weight, without getting too scientific or complex, is ‘Calories In versus Calories Out.’ In order to lose weight, you must create a caloric deficit, meaning you must burn more calories than you consume in a day. This caloric deficit causes your body to burn stored energy (mainly fat) for energy needs exceeding what is readily available (your daily intake). Shirataki noodles are 100% fat free. Reducing the amount of fat in your diet, especially ‘bad fats’ found in processed foods, can help you shed unwanted pounds. It is also better for your heart! This one is pretty straight forward. The less fat you consume, the less fat your body will store. Of course, it isn’t always that simple. Fats are essential to countless processes that take place in the body and provide you with the most energy per gram compared to carbohydrates and proteins. Fats are essential; we can’t live without them. ‘Bad fats’ (saturated and trans fats), which have been shown to negatively impact health, especially the heart, are what should be limited. Swapping out certain processed foods that contain high levels of these fats we should avoid can not only help you lose weight, but also improve heat health as well. Shirataki noodles are low in carbohydrates, provide zero net carbs, and are low glycemic – meaning they have a minimal effect on blood sugar levels. To put this in perspective, 1 cup of cooked, small shell pasta contains 35.5g of carbohydrates, 12% of the average person’s total daily requirement. While carbohydrates are an essential nutrient the body requires for every day bodily processes and as an energy source, the average person consumes too many, and often, the wrong type of carbs. Processed, refined, high-glycemic carbohydrates can halt your weight loss efforts because of their negative effect on blood sugar levels and metabolic function. Carbohydrates are broken down into sugars during digestion, and when your body receives more carbs than it needs, it stores them as fat. Swapping out starchy foods that are high in carbohydrates with shirataki noodles can reduce the amount of sugars your body stores as fat and help you avoid spikes in blood sugar levels that will leave you tired and hungry for more in no time. One serving of shirataki noodles provides 3-4g of dietary fiber. Fiber is filling, so it will help you to stay feeling full for longer, works to regulate the digestive system, and helps remove cholesterol and other harmful substances from the body. The healthy dose of fiber shirataki noodles provide, combined with their low-to-no calorie count, means you will feel fuller for longer, so you’ll be less tempted to snack between meals - all without putting a huge dent in your daily calorie budget. A winning combination! One common reason many people have a difficult time sticking to a healthy eating plan is because they deprive themselves of the not-so-good for you foods that they love. Completely depriving yourself of your favorite foods often leads to overeating or binging when you finally allow yourself to eat them. Shirataki noodles are a perfect substitute for traditional pastas, allowing you to enjoy the dishes you love – guilt free! About the Author: Skinny Noodles is one of the premier brands of shirataki noodles in the USA that are also made in the USA. Visit www.getskinnynoodles.com for more information about shirataki noodles, how they can help improve your health, and for delicious recipes.